To Slemmestad on the "Ships starting with S" page. (Post War). Received from, and painted by, Jan Goedhart, Holland. See also this external page (click in the thumbnails to enlarge). Dave Napier, England came across a gravestone for a Norwegian seaman named Salve Lislevand. He took a picture of it and sent it to me. I looked the name up in "Våre Falne", a series of 4 books listing all Norwegian casualties during WW II, and found that Salve Lislevand served on Slemmestad when he became ill and died on Nov. 22-1943 (birthdate is given as March 27-1894 in the book). He's buried in Arno's Vale Cemetery, Bristol, and here's the picture of his headstone. If a relative sees this and would like a larger, better quality picture, I'd be glad to pass it on, just contact me at the address provided at the bottom of this page. Built by Burmeister & Wains Maskin- og Skipsbyggeri, Copenhagen in 1928 (who also supplied her machinery). Aug. 9 Methil   OA 196 For Key West. Oct. 2 Liverpool   ON 22 For Hampton Roads. 1942 Jan. 5 Liverpool   OS 16 For Alexandria. March 21 Suez Aden  Independent Page 2 gives arrival March 26. Dec. 19 New York City Clyde Jan. 7-1943 SC 114 See also narrative below. 1943 Febr. 21 Clyde St. John, N.B. March 13 ON 168 (See also Page 3). March 27 Halifax Loch Ewe Apr. 9 HX 231 Convoy will be added. May 15 Loch Ewe Halifax May 29 ON 184 Convoy will be added. Aug. 14 Loch Ewe New York City Aug. 27 ON 197 Convoy will be added. Sept. 15 Hampton Roads Algiers Oct. 5 UGS 18 For Algiers. *Page 3 gives arrival as Nov. 19, but that seems like a long time to get from Algiers to Oran. Nov. 23 Passed Gibraltar   MKS 31G Rendezvoused with SL 140, Nov. 24. (See link to MKS 31). 1944 Jan. 14 Liverpool   OS 65/KMS 39 For Augusta. Jan. 26 Convoy split Passed Gibraltar Jan. 28 KMS 39G For Augusta. Jan. 28 Passed Gibraltar Syracuse Febr. 3 KMS 39 For Syracuse. Left Syracuse for Augusta, Febr. 6, arrived same day (again, see Page 3). March 15 Augusta Gibraltar March 22 MKS 43 Augusta to UK. March 22 Gibraltar   MKS 43G 5 Passengers, 860 Mails. Rendezvoused with SL 152, March 23. (stop at Gitmo not mentioned). Sept. 26 New York City Boston  Independent Page 4 gives arrival Sept. 28. Nov. 29 Liverpool Halifax Dec. 16* ON 269 *Page 4 gives arrival Dec. 11. 1945 Jan. 12 St. John, N.B. St. John, N.B. Jan. 13 FH 153 Put back. March 3 Liverpool New York City March 19 ON 288 Convoy will be added. May 19 New York City Boston  Independent Page 5 gives arrival May 21. Please follow the links provided for more details on the convoys mentioned here - several Norwegian ships took part (the Commodore's notes are also available for some of them). For information on voyages made in between those noted below, please see the documents received from the National Archives of Norway and A. Hague's Voyage Record above. From Page 1 of the archive documents, we learn that Slemmestad was in Buenos Aires when war broke out in Norway on Apr. 9-1940, having arrived from Norfolk on Apr. 2. She subsequently remained there for several weeks, before proceeding to Montevideo at the end of May, then on to Freetown, and according to Arnold Hague, she now joined Convoy SL 36, which departed Freetown on June 15 and arrived Liverpool July 3; Slemmestad, cargo of wheat, arrived Weymouth Bay that day. The Norwegian Belmoira, Bianca, Fernhill and Sandanger are also listed. The following month, we find Slemmestad in Convoy OA 196, which left Methil on Aug. 9 and dispersed on the 15th. Akabahra, Fidelio, Gulhaug, Isbjørn, Sommerstad and Tai Yin are also included. Slemmestad's destination is given as Key West, station 53; according to the archive document, she arrived Baltimore on Aug. 27. Please follow the external links provided in the Voyage Record for more details on these convoys. Her subsequent voyages, which were made independently, are shown on Page 1 and Page 2. As can be seen, she made some voyages to Japan. It'll also be noticed that she had quite a long stay in Baltimore in the summer of 1941. At the end of Aug.-1941, I have her in station 95 of the Halifax-U.K. Convoy HX 147, along with the Norwegian Nueva Granada (station 104), Bello (114), Solør (54), Sandanger (station 103, which means she was the 3rd ship in the 10th column, right behind Bralanta and in front of Nueva Granada), Bralanta (102), Strinda (63), G. C. Brøvig (44), and O. A. Knudsen (112). Some of these ships, including Slemmestad, later returned across the Atlantic with Convoy ON 22*, departing Liverpool on Oct. 2, dispersed Oct. 15, Slemmestad arriving Hampton Roads on Oct. 20. Eglantine is named among the escorts - see ON convoy escorts. Slemmestad headed back to the U.K. on Nov. 8 in Convoy HX 159 from Halifax and subsequently had a long stay in Liverpool (Page 2). Early in Jan.-1942, she's listed in station 75 of Convoy OS 16, on a voyage from Liverpool to Cape Town/Port Said/Alexandria. Several Norwegian ships are included in this convoy, which left Liverpool on Jan. 5 and had Freetown as its final destination (link in Voyage Record). Slemmestad arrived Cape Town on Febr. 7, leaving again for Aden the next day; again, see Page 2 as well as Page 3 for details on her subsequent voyages - most of these were made independently, but convoy information for a few of them can be found in the table above. (As can be seen on Page 2, she spent a month in Buenos Aires in the summer of 1942). She was scheduled for Convoy HX 219 from New York on Dec. 13-1942, but did not sail. Arnold Hague has instead included her in the slow Convoy SC 114*, departing New York on Dec. 19, arriving Liverpool Jan. 7-1943; Slemmestad stopped at Clyde that day. In Febr.-1943, we find her in the westbound North Atlantic Convoy ON 168*, which originated in Liverpool on Febr. 21 and dispersed March 12, Slemmestad arriving St. John, N.B. the next day. According to Arnold Hague, she subsequently returned to the U.K. in Convoy HX 231*, originating in New York on March 25, arriving Liverpool Apr. 10 (having lost several ships; ref. external link at the end of this page); Slemmestad joined this convoy from Halifax, leaving March 27, and stopped at Loch Ewe Apr. 9, proceeding to Methil Roads the next day, then on to Tyne, where she appears to have spent almost a month (Page 3) before heading across the Atlantic again with the westbound Convoy ON 184* (Commodore in Samuel Bakke). This convoy originated in Liverpool on May 15 and arrived New York on the 31st; Slemmestad, however, started out from Loch Ewe on the 15th and stopped at Halifax on May 29. Having made a voyage to St. John, N.B. and back to Halifax, she joined Convoy SC 135 on June 27, later returning in Convoy ON 197* (from Liverpool Aug. 14, to New York Aug. 28, Slemmestad again joined from Loch Ewe). From the U.S., she now headed to Algiers, where she arrived Oct. 5 (Convoy UGS 18 - link in Voyage Record). Having remained in Algiers for over a month, she made a voyage from Algiers to Oran in Nov.-1943, joining Convoy MKS 30, which had originated in Port Said on Nov. 2 and arrived Gibraltar Nov. 13. Slemmestad had sailed from Algiers on Nov. 11; Page 3 gives her arrival Oran as Nov. 19, but surely, it wouldn't take that long to get from Algiers to Oran? I believe this date might be a typing error (as can be seen in the Voyage Record, A. Hague says she arrived Oran on Nov. 12, and that makes more sense). She left Oran again on Nov. 22, joining Convoy MKS 31, which met up with Convoy SL 140 off Gibraltar on Nov. 24, proceeding to the U.K. as the combined Convoy SL 140 / MKS 31, arriving Liverpool on Dec. 7 (Slemmestad's arrival is given as Dec. 10 - she had a cargo of iron ore). SL 140 had started out from Freetown on Nov. 12. In Jan.-1944, we find her in Convoy OS 65 / KMS 39, voyage Liverpool-Sicily in station 41 of the convoy, which left Liverpool on Jan. 14 and split up on the 26th, the KMS portion arriving Gibraltar on Jan. 28, while the OS convoy proceeded to Freetown. Slemmestad was in KMS 39*, which continued from Gibraltar on Jan. 28 with Port Said as its final destination, but Slemmestad arrived Syracuse on Febr. 3, later continuing to Augusta, where she arrived Febr. 6 (Page 3). In March, she's listed in Convoy MKS 43*, joining from Augusta. At Gibraltar, this convoy joined up with the Freetown Convoy SL 152 on March 23 and proceeded to the U.K. as the combined Convoy SL 152 / MKS 43, arriving Liverpool on Apr. 4. Her voyage information is given as Catania to Loch Ewe with lemons, general, mail and passengers. Ref. links provided in the Voyage Record for more information on the combined convoys; other Norwegian ships are also included. Slemmestad's voyages in this period are shown on Page 4. She now made another Trans-Atlantic voyage, having joined the westbound Convoy ON 233*, which left Liverpool on Apr. 20-1944 and arrived New York May 8. In June she can be found among the ships in the New York-U.K. Convoy HX 295, bound for London with sugar (Commodore was in the Norwegian Elisabeth Bakke). 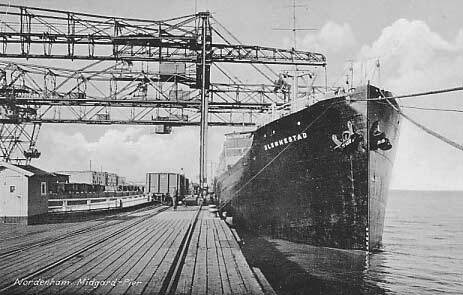 Slemmestad arrived London, via various other ports, on July 1, later heading back across the Atlantic with Convoy ON 247*, originating in Liverpool on Aug. 2; Slemmestad sailed from Loch Ewe that day. With a general cargo and sugar for Liverpool, she joined the slow Convoy SC 158 from Halifax on Oct. 4, and after having stayed in Liverpool for over a month (Page 4), she returned with Convoy ON 269*, which departed Liverpool on Nov. 29 and arrived New York Dec. 15; Slemmestad, however, was bound for St. John, N.B., where she arrived, via Halifax, on Dec. 18. 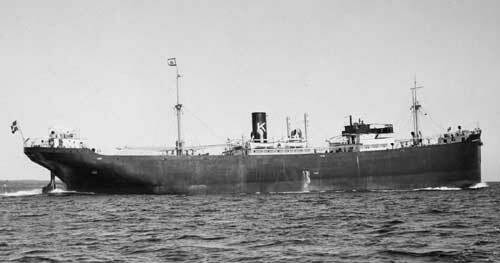 On Jan. 16-1945 we find her in the slow Convoy SC 165 from Halifax, bound for Liverpool with general cargo, again remaining there for quite a long time, before joining the westbound convoy ON 288* with 9 other Norwegian ships, according to "Nortraships flåte", namely Villanger, Viggo Hansteen, Tanafjord, Dageid, G. C. Brøvig, Polartank, Heranger and Harald Torsvik, as well as Høyanger, but note that Høyanger is listed in the next convoy, ON 289*. ON 288 left Liverpool on March 3 with 108 ships, and arrived New York on March 19. The Norwegian commodore, R. G. Bruusgaard, was in the British Port Fremantle. According to Arnold Hague, Slemmestad made one more eastbound North Atlantic convoy voyage. This was made in Convoy SC 177*, which left Halifax on May 26-1945 and arrived Liverpool on June 8 - Slemmestad, cargo of sugar, arrived Downs that day, then proceeded to Hull, see Page 5. This document also tells us that she got to go home to Norway in Aug.-1945, making another voyage home before the year was over, and again in March-1946. * The ON convoys will be added to individual pages in my Convoys section in due course, with further info on each, in the meantime, the ships sailing them (and escorts) are named in the section listing ships in all ON convoys. Note also that the entire SC series and the HX series will be updated and completed (including the already existing convoys - some have already been updated), but for now, see ships in all SC convoys and ships in all HX convoys. Additionally, all the MKS and KMS convoys will be added, see ships in MKS convoys and ships in KMS convoys. 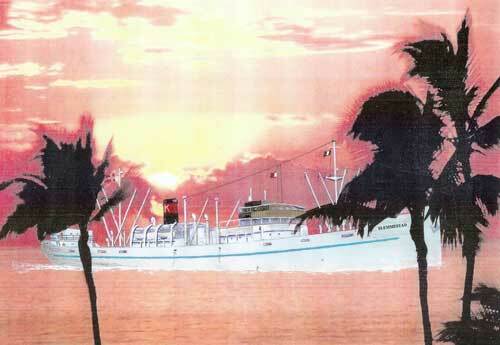 On fire March 27-1951, beached near Dar-es-Salaam. Total loss. Back to Slemmestad on the "Ships starting with S" page. The text on this page was compiled with the help of: "Nortraships flåte", J. R. Hegland, and misc. for cross checking info (ref. My sources).